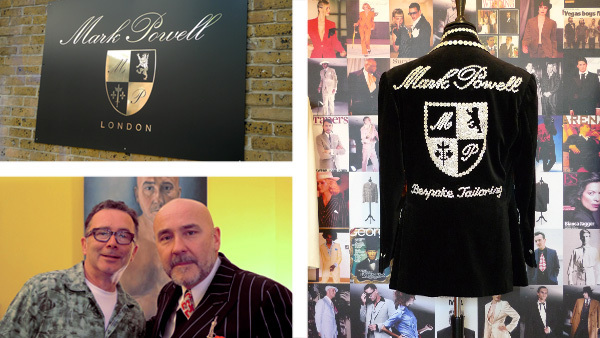 Over the last 20 years Mark Powell has been recognised as one of the world’s most iconic and influential bespoke tailors of our time. Born in Poplar, east London, he has dressed countless of iconic celebrities such as George Clooney, Mick Jagger, David Bowie and Paul Weller from the worlds of film, television, music and sport. Instead of our normal quick chats at Bar Italia, Mark invited me around (not to buy a suit, more of a face to face catch up) to the shop located in Marshall Street, in the heart of Soho. Along with me was actress Annabel Wright and together with Mark’s assistant Shivaun, the chatter revealed how busy Mark was and that he was always on the move. With the 65th Cannes Film Festival well underway the conversation swiftly focussed to fashion on the red carpet. Mark is no stranger to these events and has dressed many celebrities for the occasion. He told us that he had just tailored the suit for Sean Bean for the premier of 'Mirror Mirror: The Untold Adventures of Snow White', which was held at the Grauman’s Chinese Theatre in Los Angeles. He expressed that he thought the Venice Film Festival was a more glamorous affair, adding, “I’ve dressed Naomi Campbell for events like this many times. The other day she was wearing a really beautiful dress I must say, she did look really good”. The conversation then moved on “There’s some very good stuff coming up. In September I’m doing a load of stuff with Mitch Winehouse, who absolutely is a darling, darling, darling of a man and a proper Londoner“. He told us “Mitch is doing a big thing in New York, appearing on a whole load of shows like ‘Jay Leno’ dressed by me”. Mark is also going over there to do a big trunk show and will be attending the Amy Winehouse Inspiration Awards and Gala Dinner, held by the Amy Winehouse Foundation. Mentioning that he also dresses Amy’s fiancé, film director mate Reg Traviss, who came to public attention in the UK in 2006 for the film ‘Joy Division’. “Reg is a really really talented guy and looks great in my stuff. He’s got the great big quiff, he’s a great guy”. Mark is next due to re-launch his website in the next couple of weeks. “We are very excited about this and it’s looking really good so far. Richard Wilding at Wilding & Friends is doing the site for us. It’s what he does as well as being a photographer. It should be great when done and we hope our customers will like this too”.